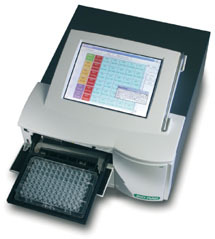 The PR 3100 TSC is a compact microplate reader which measures the absorbance of specimens in 96-well plates. Included in the configuration are five pre-installed filters (405,450, 492, 550, 620 nm) and pre-programmed assays for the complete range of Bio-Rad EIA kits. The broad color touchscreen together with a wizard interface offers comprehensive data reduction with a streamlined operation for all assays.